Two weeks ago I wrote about the joys and challenges of making theatre, so I thought I would use this week to give a unique example of how a specific show came to be created. In doing so I shall also engage in some shameless self-promotion. Brace yourself.The actors who appear in our Theatre Royal 2013 season from Friday to Wednesday perform thirteen shows per week, over the course of six days. They only get one single day off. This is where I come in. I made the decision to step back from a full theatre schedule this season and only do a single show per week, which covers the day off for the rest of the cast. On Thursdays at 1 pm I perform my newest solo show: Catherine Schubert: A Lady Overlander. What is an Overlander? In a nutshell: the Overlanders were a group of gold seekers who made the trek to BC from Winnipeg in 1862, at a time when there were no roads or established trails across what is now Western Canada. Irish immigrant Catherine Schubert was the only female to join the largest official overland party. She travelled with her husband and three small children, and was pregnant as she rode and walked across North America. That’s the basic story. The story of my story of Mrs. Schubert begins in 2008, when I was contracted by a theatre company to write scripts to be performed during the Royal BC Museum’s sesquicentennial exhibition – Free Spirit: Stories of You, Me and BC. I wrote stories from BC’s past and performed (in character) in a tiny theatre just big enough to accommodate one stool and one actor. My favourite piece was one I wrote about Catherine Schubert. I performed this fifteen minute tale a couple of times a day for seven months. At the end of the contract, I put Catherine Schubert away for good. Or so I thought. In 2012 I felt an urge to add another show to my repertoire at the Theatre Royal in Barkerville (I was moving into my third consecutive season of performing a different solo show called The Bride of Barkerville, and itching to add something new). It occurred to me that the story I had been so fond of at the RBCM could be reconfigured into a stage show proper, rather than a static storytelling set. I asked my producers at the theatre if they would consider allowing me to add an Overlander piece to our schedule. We all agreed that, although the story of the Overlanders is not specifically a Barkerville tale, it is absolutely a Cariboo Gold Rush story, and so fit perfectly with our more historical offerings. Last season, “Catherine Schubert: A Lady Overlander” became a 30 minute show performed in rep in the 11:00 am time slot at the Theatre Royal. At the end of the 2012 season, I put Mrs. Schubert away once again. This past winter the Theatre Royal producers asked me if I would consider expanding the show one more time, so it could be the Thursday show. So, for the second time in five years I pulled out my notes and set about expanding the script. On June 15th I premiered the third version of “Lady Overlander,” which now clocks in at about 45 minutes. This is the first time in my theatre career that I have performed three different versions of the same piece (not to mention a piece that I wrote). Clearly this is a show and a story that is meant to stay in my life. For that I am three times lucky, and extremely grateful. 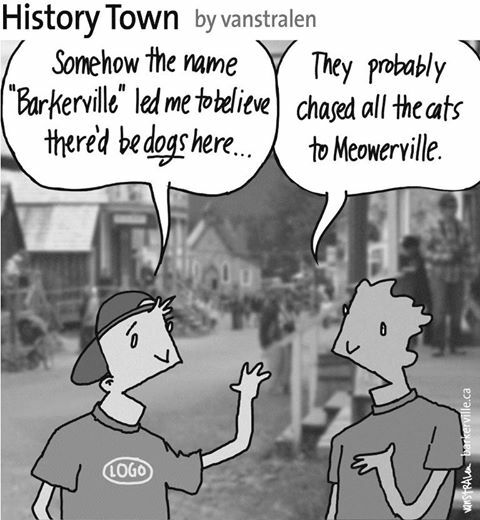 The above one-panel cartoon by Dirk Van Stralen, with accompanying editorial by Danette Boucher, is the seventh of twenty weekly entries that will be logged – and subsequently blogged – as part of a 2013 collaboration between Barkerville, British Columbia and the Prince George Citizen aimed at introducing some of the quirkier advantages to living, working, and playing in the Cariboo Goldfields. We hope you enjoy!